Trying to decide the best way to cover your windows? Whether you’re a home décor genius or just someone wanting a house that’s pleasant to live in, we think shutters are the best option. Here are some compelling reasons to have shutters in your home. 2. They give you better temperature control. 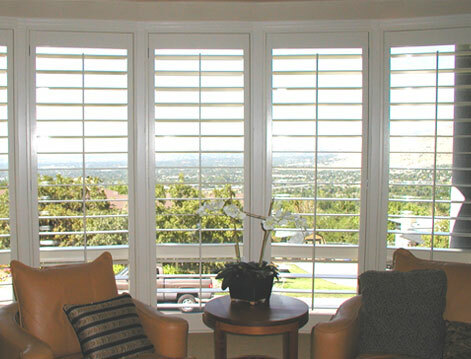 Having shutters in your home allows you to regulate temperatures far better than blinds do. In the winter, the material they’re made of (called Thermalite) helps keep cold drafts away, and contains warmth in a room. In the summer, they block the sunlight that causes that stuffy, overwhelmingly hot greenhouse effect. 3. They’ll help you sleep better. There’s nothing worse than trying (and failing) to take what should be a glorious nap, only to be thwarted by middle-of-the-day sunshine. Shutters allow you to stop sunlight entering your room, leaving you free to nap to your heart’s content, regardless of what time of day it is. 4. They’re easier to clean. Does anyone even know the best way to clean curtains? It’s definitely a big hassle. Shutters are easy to clean, as they only require a quick swipe to become dust-free again. This will also help with allergies! Because of their insulation powers, shutters can help reduce your energy bills. (You won’t need to keep cranking up the heating constantly when it’s cold outside!) They’re also affordable to buy and install. Shutters last a lot longer than blinds, which tend to break easily. There’s nothing more annoying than having to change a blind slat because yet another one has come off. Shutters, when purchased from a good company and installed properly, should last for as long as your home stands.